Alps Mountaineering Lynx 2-person tent is the 2-person option of the basic model we saw just above us. As a result it is more expensive but we shall see if it is worth the extra amount of money. It has more fun attachments and features than the basic model 1 in addition to having more space and comfortably housing 2-3 people with ease. The Alps Lynx 2 has two doors for greater access and an even greater point is it does have two additional vestibules for each person’s gear too. There is a large floor space inside where you could house up to two people plus all their gear easily. More than half the walls are taken up by mesh netting so it is well ventilated inside along with high ceilings and ultimate weather protection. Lynx 2 tent has some awesome features. The extra large #8 zippers for example along with the nylon- no see mesh create a sleek and modern design. The tent also utilizes high grade aluminum poles which are in a rectangular dome style with pole clips that easily attach over the poles for quick assembly. You can have this tent up in 5 minutes flat! Poly Taffetta and 1500mm multi-pass urethane coating cover the fly means that when it rains, little to no penetration will occur. You will be completely dry no matter how hard the rainfall will be. The fly buckles are also weather proof, meaning that even as other plastics swell in the heat, the ones on this tent are specifically designed to be durable an stand the test of time. This is a lightweight, basic model 2 or more persons tent; perfect for the amateur camper that needs something basic to get the job done. It can be set up within 5 minutes and packed down in the same. 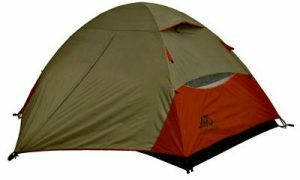 It has an awesome high-quality frame that is designed to withstand mild storms and can be used in all types of weather. The color variations are matched by the Lynx 1 model. They have an olive/green outer shell which I perfect for blending into a forestry background, but they also have a bronze/copper lower lining. For a cool effect the frame is also this copper color which gives the tent and extra flair. The tent zipper tags are also copper so they can be easily identified and pulled up or down. Two extra vestibules, great storage space for gear. Lynx2 is lightweight and super durable. Cheaper than most 2/3 person tents on the market. Two pole design makes it easily manipulated by weather. Limited features; other tents have more additional extras. Could be easier to take down and transport. Final word, Lynx 2 is one of the best 2 person tent. It is basically a larger model of the Lynx 1 person tent, which is exactly what says it is. What is great about this tent is that it doesn’t try and be something that it isn’t- which is fantastic. In all honesty it could have more features and I think that it has run out of ideas. There is so much space in this tent they really could have done more with it. Overall it is great and worth the money if you are a basic camper. Thanks for reading The Alps Mountaineering Lynx 2 Review / Alps Lynx 2 Review.